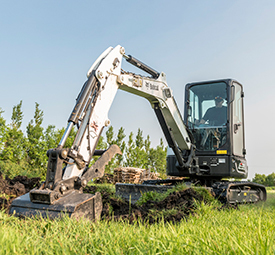 Part of the R-Series, the Bobcat® E35 compact excavator is a popular choice in the 3-ton size class. Zero Tail Swing provides unrestricted rotation, greater flexibility and reduced potential for damage to the machine and surrounding property. It’s available with an angle blade option, long arm option or clamp-ready extendable arm option. The E35 excavator can be upgraded with an optional 33-hp engine for even more productivity. Learn more at bobcat.com.